Bag of Jelly Beans with Personalised Label is a perfect way to thank all your wonderful guests for coming to celebrate a new baby being born into the world. They can also be used as winners prizes with the personailed label exclaiming "You are a Winner!" 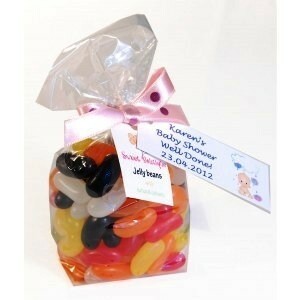 As stated above these sweets are ideal for use as baby shower favours or game prize winners. Please enter your personalised message into the text box below.